While satellite M2M has been around for over 20 years, it is gaining even more traction now as hardware and services become more affordable, and as organizations understand the real costs of leaving critical remote assets unmonitored. Cellular networks only cover 10% of the world, so satellite M2M with its ubiquitous coverage will be the technology of choice for many applications. While initially focused on land mobile and maritime applications, satellite M2M has expanded to provide communications for oil & gas, energy/utilities, government, mining and other sectors where valuable equipment is spread out over large geographical areas. Beyond coverage, satellite is becoming a popular choice for M2M deployments due to low power consumption, and ease of integration and installation. Dual-mode satellite-cellular solutions are a popular choice for the transportation market—low-cost cellular in urban areas and the reach of satellite in those in between areas. Customizable M2M devices can be programmed or configured to offer up the right information, to the right people at the right time. 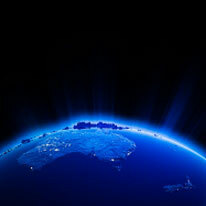 Read the full post on the M2M Connectivity blog to learn more about satellite M2M, and why it’s becoming a technology of choice for solution providers in Australia, New Zealand and anywhere that vital industrial assets need to be remotely monitored.